Live intentionally, retire on time (or sooner), and finally live your passion! Being able to retire, especially after spending your life financially behind, can be difficult, to say the least. Between raising a family, paying bills, living paycheck to paycheck, your days can seem overwhelming and you might think you’ll never be able to retire. If you haven’t had a chance to read the post, Dreaming of Retirement, So Far Behind, be sure to check it out, too. But, one of the best ways to reach your retirement goals and relieve some of your stress is by applying intentional faith to reach your retirement goals. Most of us live in faith by going to church, reading and studying our bibles, and saying a daily prayer or two. Despite these activities of faith, the rest of our days are filled with things like work, errands, housework, being unsatisfied with your job, juggling bills, and more. When you are so focused on just getting through the day and managing the tasks at hand, it’s really difficult to keep your heart open to Christ and to spend time doing things that fill you with passion and purpose. Living a Christ driven, purposeful life is a little different for everyone, but in general a purposeful life in Him means that you are getting rid of any of the doubts, fears, joy, and stress that prevent you from focusing on getting your finances in order and finally living a life you’re passionate about. 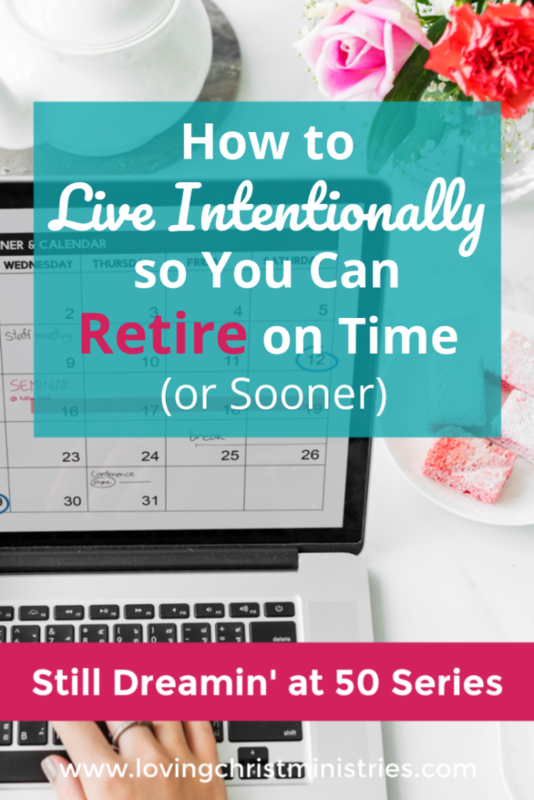 By starting to live intentionally so you can retire on time or even early, you can be more in control of not only your present days but your future as well. In addition, you’ll be able to more quickly live a life you love and be so much happier. It’s up to you which of these things on the list below you choose to do. However, the more of these ideas you implement, the quicker you can reach your goal of retiring on time, working or volunteering on things that you actually enjoy, and making sure your finances are in order so that you are in charge of your life. Prayer is your first and fastest method to communicate with God. When you start your day in prayer and continue with popcorn prayers (short prayers that pop up throughout the day) then you will be able to maintain your focus on how you want to spend your time. Trust God and know you’re designed for great things. Luke 22:6-7 Are not five sparrows sold for two pennies? And not one of them is forgotten before God. Why, even the hairs of your head are all numbered. Fear not; you are of more value than many sparrows. Money, lack of it, or failure to manage it will hold us back from the freedom of choosing what we do with our days. Debt and lack of savings can keep you in a job you don’t like because you have to pay bills or even just to make ends meet. Once you’re behind financially, it can be very tough to catch up or get ahead. Believe me, I know how stressful it feels to worry about finances. My husband and I are 2007 graduates of Dave Ramsey’s Financial Peace University. We learned all we were supposed to do, but actually living intentionally each day with our finances didn’t go well. I hate to admit it, but we just haven’t been good stewards of our money, not consistently anyway. Because of this, I have had to work longer in a job I don’t feel passionate about. If I’d only stuck with the Total Money Makeover, I would be able to retire right now. Find a way to earn extra income/retirement income doing what you’re passionate about. Dave Ramsey talks about delivering pizzas, and I know people who’ve done this. Others I know, work a part time job. I’ve considered working part time at our local library or bookstore, but I know what I really want is to be my own boss and earn money from my writing. Some freelance writers make a nice living or part-time income from freelance writing. Fiverr is a place you can offer services. I’m sure there are others, but I have not done any freelance writing, so I don’t feel comfortable telling you what to do in this area. Blogging has given me a way to earn an income with my writing, and I’m so thankful to have finally found my passion. There is a learning curve with the tech side of blogging, but I am happy to share with you some of the tutorials I put together for you to help if you decide to start a blog. I’m a computer teacher by day, so creating these tutorials is so much fun for me! Clutter and I have had a lifelong love/hate relationship. 28 years ago, when I first began teaching I taught in a school that was so overcrowded that I didn’t have my own classroom. Instead, I had to pile all my classroom materials on a cart and travel room to room using rooms that were empty for the hour while the teacher was on their plan time. I became an expert at stacking things to make my cart look neater. Everyone thought I was on top of things and were so impressed with my organizational skills. Little did they know I had to search through my stacks to find things and never could quite create a system that worked for me. Unfortunately, stacking things carried over into my home as well, and we frequently lived in a house full of things we didn’t need. Having so much junk stressed me out immensely. Many times, I would be so overwhelmed by having so much stuff that I’d shut down, fail to de-clutter, and then become even more overwhelmed as junk continued to collect. Once I began a de-clutter routine every single week, life became for much better! That routine is one of the many ways I use my Living Well Planner. I also use it for meal planning. For me, meals were another area I needed to simplify. We tend to eat the same thing every night. Then, once we grow too tired of the same ol’, we order out. Ugh! What a waste of money to do that multiple times per week. At least for us. I know many people are happy budgeting to eat out often, but it simply kills our budget. For the last few months, I’ve been sitting down every Sunday with my planner and writing in meals for the week. My husband, daughter, and I brainstorm together and choose meals that are simple to prepare and that we know we’ll love to eat. I began using my Crockpot more and more. We don’t have an Instant Pot yet, but they’ve come highly recommended so I may look into that. It’s amazing to me how making mealtime simple through planning and easy recipes has made my life less stressful and best of all, has helped us save at least $100 per month. Tightening that plan up some more sounds good, too! Now, to throw that extra money at our debt snowball and we’ll be debt free even faster which means – bahmp bahmp bahm (drum roll) – I can retire from my day job ON TIME and finally live MY passion, writing and sharing Christ’s love with everyone! Thank goodness I have an amazing family around me who encourages my writing and blogging. My closest friends keep urging me to keep going for my dreams as well. I’m thrilled they support me even though they really know nothing about blogging. Even neater, in my opinion, is that I’ve found a group of online blogging friends through the Elite Blog Academy Facebook group that knows exactly what I”m going through as I work to build my blog and share my writing with others. That’s so much fun! No matter what your own goals and dreams are, make sure you’re surrounded by people who, even though they may not understand, love, support, and encourage you! As I mentioned earlier (wayyyyy up there in this super long post), Living a Christ driven, purposeful life is a little different for everyone, but in general a purposeful life in Him means that you are getting rid of any of the doubts, fears, joy, and stress that prevent you from focusing on getting your finances in order and finally living a life you’re passionate about. By living intentionally, you’ll be able to focus on what’s most important to you so that you can retire from your day job and start living each moment as you feel called. And then, with all of that joy in your heart from following your call, imagine the impact you’ll have on others as you share God’s Kingdom! I definitely need to grow in this area, Julie. Thank you for giving me practical tips to apply. Pinned! We’ve been trying to be better stewards of our money lately by cooking at home and cutting out the clutter. We’ll have to try some more of these tips. Thanks! It can be so hard, but with focused effort it can certainly be done. It’s worth it for sure!